There’s some new standard equipment for the 2013 Highlander Hybrid, including an Entune-enabled version of Toyota’s Display Audio infotainment system. The Leather Premium package also includes more content than before. While the Highlander Hybrid might not look much different than its traditional counterpart with its rounded-out angles and swooping body lines, there is one major difference for the hybrid SUV—it’s badging. Light blue highlights can be seen on the Toyota badging throughout the car, while the “Hybrid” label shows that, though this SUV looks like a major gas guzzler, it is actually one of the best hybrid SUVs on the market. In order to get the most efficiency out of its hybrid power system, the 2013 Highlander Hybrid combines a 3.5-liter V6 gasoline engine and three different electric motors. Both the gasoline engine and the electric motors can work on themselves or in tandem, changing based on the driving conditions. Together, they produce 280 horsepower. This set up comes standard with front-wheel-drive and a continuously variable automatic transmission (CVT) with the rear wheels powered by a separate electric motor. The EPA-estimated fuel economy for this hybrid SUV is one of its biggest selling points with an impressive 28 mpg combined, making it significantly more fuel efficient than its gasoline-only powered sibling. 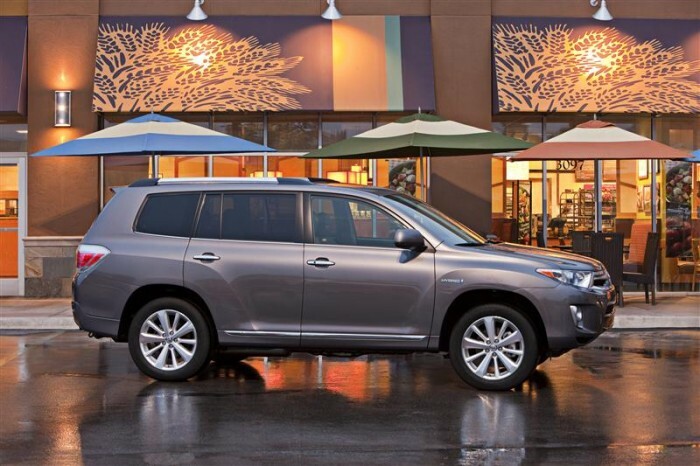 The 2013 Highlander Hybrid combines easy-to-use gadgets and a clean, simplistic design to create a comfortable, practical interior. A 6.1-inch screen is used for the standard navigation system, with a wide center console making it easy to control the various amenities the SUV provides. The second-row seats slide and seatbacks recline, making it easy to get comfortable. Cargo space isn’t amazing in this SUV, but we think the fuel efficiency definitely makes up for it. Safety features such as antilock disc brakes, traction and stability control, multiple airbags, and active front head restraints helped the Highlander Hybrid earn a four out of five star rating in overall crashworthiness after government crash testing.